At just after 5am, the catering staff wheeled in a trolley laden with bottles of Johnnie Walker Red Label whisky. It was in the good old/bad old days of EU marathon farming talks which rarely, if ever, ended before breakfast. That EU decision-making process was called “consensus by attrition” – “we’ll keep you at it until you do a deal” to you and me. And the early morning offer of a “whacker” to agriculture ministers and their advisers was designed to boost the innate optimism from an emerging new day, and make compromises finally happen. We were in the Luxembourg EU conference centre in late June 1996, a pre-9/11 time when security was not driven by total paranoia, and a long-time journalist could at times roam corridors that were technically off-limits. At the time, the UK was rightly in the firing line in another big row, this one about the BSE mad cow disease which left it at serious odds with all its EU neighbours. It was a harbinger of the times we have been living through since another less hopeful dawn on Friday, June 24, 2016, when we learned that our nearest neighbour, and one of our strongest trading partners, was abandoning the EU trade bloc upon which Ireland had pledged so much of its national fortunes. By now, some of us would be minded to hit the credit union, club together and sponsor that whisky cart, if only it yielded some relief via a serviceable Brexit outcome. But us Brexit addicts, a subset of the political anoraks, we know that, even though something is about to happen, this issue ain’t going away soon. Today begins a two-day countdown to Wednesday and another EU leaders’ Brexit summit. Everybody across the EU capitals remains fixated by what is likely to emerge from London. The Brexit deal-or-no-deal deadline remains this Friday at 11pm. 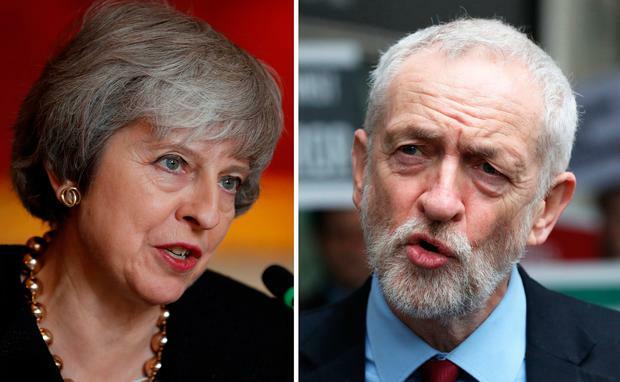 Conservative-Labour talks aimed at jump-starting plans for Brexit continue amid more hope than confidence. Prime Minister Theresa May reluctantly reached out to Labour last Tuesday after the Westminster parliament rejected her EU-UK divorce deal for the third time. The furious rhetoric from pro-Brexit MPs in her Conservative Party continues unabated. And three days of bargaining between the Conservatives and Labour appear far from yielding a compromise agreement. But like all these intense talks, it depends who you listen to. Yesterday, Labour leader Jeremy Corbyn blamed the government, saying it showed no willingness to budge from its previous Brexit positions. But Labour business spokeswoman Rebecca Long-Bailey was more hopeful, saying that talks would continue. She told the BBC that the overall mood was quite a positive and hopeful one – despite the government’s disappointing failure to shift its stance on several issues. “The sad thing is at the moment, we haven’t seen overall any real changes to the deal, but we are hopeful that will change in the coming days, and we are willing to continue the talks as we know the government are,” she said. “We are currently waiting for the government to come back to us now to state whether they are prepared to move on any of their red lines,” Ms Long Bailey added. Those red lines are proving to be a major albatross for the UK prime minister. They include her ill-starred insistence that the UK leave the EU customs union and the border-free single market as part of Brexit. Labour wants to continue a form of EU-UK customs union and stick closely with the single market. That would be a great help to Ireland, north and south, so fingers crossed. On Saturday, Theresa May publicly admitted that given three defeats for the EU-UK provisional deal she signed off on November 25 last, that “there is no sign it can be passed in the near future”. Hence the Conservative-Labour talks. But Mrs May warned that any form of Brexit could “slip through our fingers” unless a cross-party compromise is found. Hard-line Brexiteers in her party remain vehemently opposed to any proposal that would continue to bind the UK to the EU tariff rules and also restrict the UK’s ability to make its own trade deals across the globe. Labour’s Ms Long-Bailey again insisted her party wants to avoid a no-deal Brexit “in any situation”. That means the main opposition party remains prepared to cancel Brexit rather than see the UK crash out of the EU with no agreement in place. Such an outcome would wreak economic havoc in Ireland, the UK and many bordering EU trading partners. It would also disrupt travel throughout Europe. Yet the Conservative ardent Brexiteers remain unfazed by the no-deal prospects. The Conservative leader of the UK parliament, Andrea Leadsom, said yesterday that a no-deal scenario wouldn’t be “nearly as grim as many would advocate”. Doing no favours to the cross-party negotiators, she also said the Conservatives were talking to Labour “through gritted teeth” to find a compromise. The radical pro-Brexiteer insisted the bottom line remained that the UK was leaving the EU one way or another as soon as possible. So, Wednesday offers another EU leaders’ summit meeting – and another Brexit extension. On March 21, the leaders opted to postpone Brexit day, originally set for March 29, until April 12, this coming Friday. But that deadline came with certain conditions. Simply put, the UK has until Friday to approve the existing withdrawal agreement, or radically change course and seek a further delay to Brexit. Otherwise it will crash out of the EU without an agreement. Theresa May has written to the remaining EU countries seeking another postponement that would extend the departure date to June 30. This is based on hopes of an alternative deal from these talks with Labour which she might be able to put through the London parliament in a matter of weeks. The UK will get an extension because the consequences of a no-deal crash-out by the EU’s second largest, and the world’s fifth largest, economy are unthinkable. But many of the remaining 27 EU member states want to attach strict conditions designed to end this rolling car-crash drama soon. Dates and timing were a big deal last time the EU leaders met. It will be no different on Wednesday. EU Council chairman Donald Tusk, who will chair the summit, has suggested putting everything off until next March. That would prevent a series of stop-start cliff-edge deadlines continually fomenting chaos. But opponents of the idea warn that it could lead to more negotiating sclerosis, pointing out that an immediate deadline finally crystallised issues and focused minds.